At 14h30, Thursday, 13th September, NSRI Bakoven duty crew were activated following reports of a man injured on rocks at Clifton 2nd Beach. 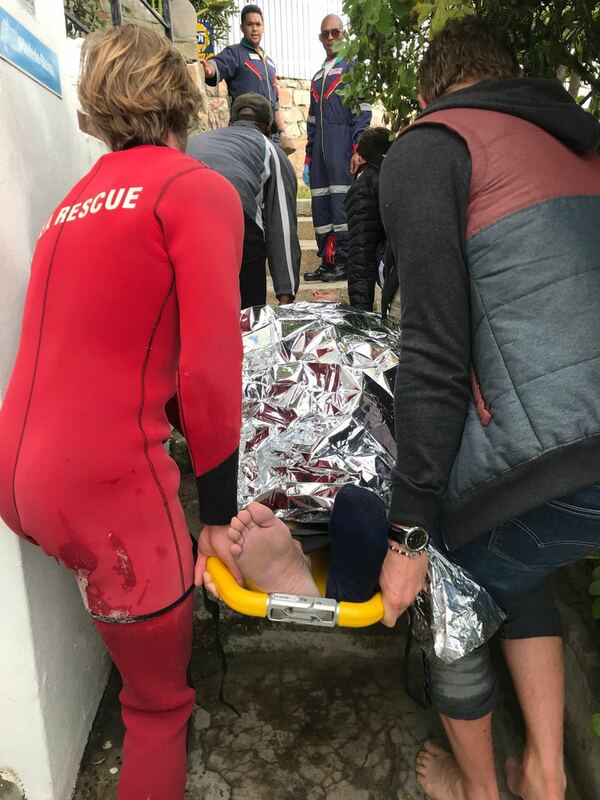 NSRI rescue swimmers and NSRI medics, CSO (Community Security Organisation) EZRA paramedics, WC Government Health EMS rescue squad, CoCT (City of Cape Town) Municipal lifeguards and Cape Town Fire and Rescue Services responded. On arrival on the scene a local 66 year old Clifton resident was found on rocks in a rising tide suffering a fractured leg sustained after he slipped while walking on the rocks. The AMS/EMS Skymed rescue helicopter was placed on alert. There was some urgency in the rising tide to extricate him off the rocks before high tide. The patient was stabilised by EMS paramedics on the rocks and brought off safely secured into a stretcher. He was brought to the roadway and has been transported to hospital by a Netcare 911 ambulance in a stable condition.